From white blankets of winter snow, to the pink blossom-covered hills of spring, lush green summer forests, and crimson carpet of fallen leaves in autumn — in the Japanese city of Kanazawa, nature is ever-changing. Nestled on the northwest of the main island of Honshu, Kanazawa was named a UNESCO City of Crafts and Folk Arts in 2009. UNESCO’s designation of Kanazawa as part of the Creative Cities Network recognizes Kanazawa’s efforts in developing and preserving many traditional crafts and folk art and fostering sustainable links between these crafts and contemporary industry. Yet Kanazawa’s rich culture and unique heritage not only stems from these links between traditional craft and contemporary city life. Over centuries, the changing natural environment has influenced profoundly the development of urban culture and society, whilst the ebb and flow of the seasons has provided a catalyst for the creation of many of the city’s celebrated arts and crafts. What lessons can we draw from this passage of the seasons about the intricate relationships between urban society, culture and nature? A recent UNU multimedia project tackles this question and offers a creative approach to bridging scientific and artistic interpretations of biodiversity. The project was conceived of and spearheaded by Anne McDonald, Director of the UNU Institute of Advanced Studies Operating Unit Ishikawa/Kanazawa (UNU-IAS OUIK), who has been exploring the interconnections between biodiversity and culture in Kanazawa since she took the post in April 2008. During her time living in Kanazawa, McDonald has experienced first-hand the rich biodiversity of the city. Interviewed in the documentary, she explains that “the different faces that nature brings to the cityscape in Kanazawa are really beautiful”. McDonald and her team have examined the crucial role that biodiversity plays in cities such as Kanazawa through various studies and reports. However, McDonald was keen to go further with this project and wanted to employ video documentary as a means to convey the results of UNU-IAS OUIK’s work to a wider audience. As such, she approached Kaori Brand, a documentary film-maker based at the UNU Media Centre in Tokyo. “I’m originally from Kanazawa, but it was initially hard to connect biodiversity and my hometown. As it’s a city, albeit not a particularly big one, Kanazawa is not famous for rich biodiversity. But, when I tried to see my hometown through the lens of biodiversity, I recognized certain things people did in order to maintain their relationship with the surrounding natural world,” Brand explains. The project comprises a documentary film (a condensed version of which is embedded above) Book of Seasons, A Year in Kanazawa, launched in late 2010, and the recently released Biodiversity in Kanazawa, a booklet incorporating descriptive text and interviews, scientific analysis and photography. McDonald, who was the overall producer of the project, also ensured its ongoing support from the governments of Kanazawa and Ishikawa Prefecture, which provided additional guidance over the course of the project. By exploring why the seasons are a powerful explanatory factor underpinning interactions with nature in Japan, both the booklet and DVD offer an example of artistic, yet scientifically linked, approaches to understanding cities and biodiversity. As the spring sunshine melts away the winter snow, newly finished kimonos are draped on a stand to dry. They are hand-dyed according to traditional Kaga yuzen silk dyeing techniques, and decorated with delicately cascading plum twigs and pink blossom. 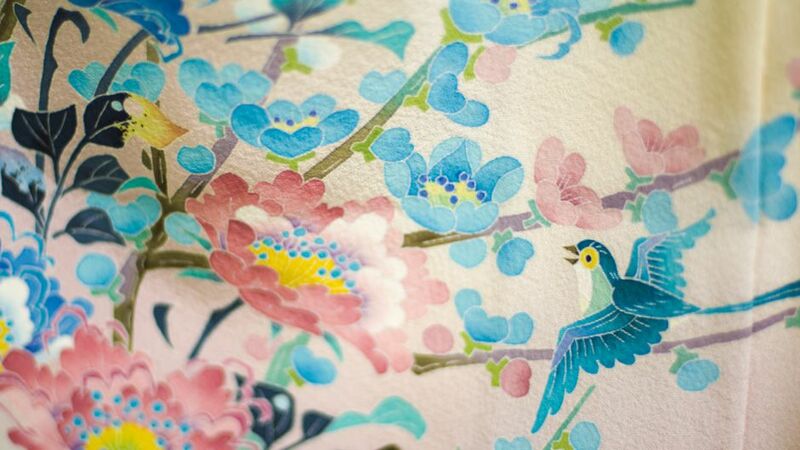 Kaga yuzen artists capture the diversity of nature in spring by painting the rich floral and plant symbols. The cherry, peach and plum blossoms are the most is popular symbol of Spring and new beginnings. Kagayuzen art “Utsuroi” by Kenji Maeda; Photo by: Ryo Murakami. Societies around the world are becoming increasingly urban. As we approach the twentieth anniversary of the first Rio Conference on Sustainable Development, the need to understand the complex relationship between cities and ecosystems has become paramount. Whilst data shows that the main drivers of biodiversity loss are directly or indirectly connected to cities, the scientific understanding of how cities and biodiversity influence each other remains fragmented. UNU-IAS researcher, writer and key collaborator in the Biodiversity in Kanazawa booklet, Dr. Raquel Moreno-Peñaranda, explains that she was intrigued by the opportunity to explore the links between biodiversity and culture in a city as fascinating as Kanazawa. “What motivated me to join the booklet project was the opportunity to engage in a more visual, cultural approach to the issue of cities and biodiversity… When we think about cities and biodiversity, we tend to think about urban ecosystems (parks, rivers, trees, flowers…), not about how a city’s functioning may impact on biodiversity outside the city’s boundaries,” she says. In the heat of summer, many of Kanazawa’s traditional vegetables are ready to harvest. Ongoing appetite and love for locally grown “Kaga” vegetables amongst Kanazawa residents reminds us of the strong link between agricultural biodiversity, food and the city’s identity. Photo: Ryo Murakami. One of the key challenges for conveying the importance of “bio-cultural-diversity” is the need to bridge the gap between scientific perspectives and urban dwellers’ unique interactions with nature, which are interwoven in culture, art and daily life. For researchers like Moreno-Peñaranda and her colleagues, this means continually oscillating between the sciences and the arts, to combine more creative, even emotional interpretations on urban interactions with nature, with an academic and technical approach. “Multimedia projects are key for linking the local to the global, and vice versa. Local stories, even if touching, lack the capacity to influence policy change without powerful concepts behind them. Likewise, dry concepts without images and human stories lack depth and breadth of understanding, so they can mislead us into taking the wrong actions,” Moreno-Peñaranda explains. The booklet and documentary skillfully link the two worlds of local- and global-level discourse and practice. “What [we] hoped to achieve… was to link culture, values, and the environmental features of a specific city as rich in culture and nature as Kanazawa, with ongoing scientific discussions on the different ways cities and biodiversity influence each other,” Moreno-Peñaranda says. 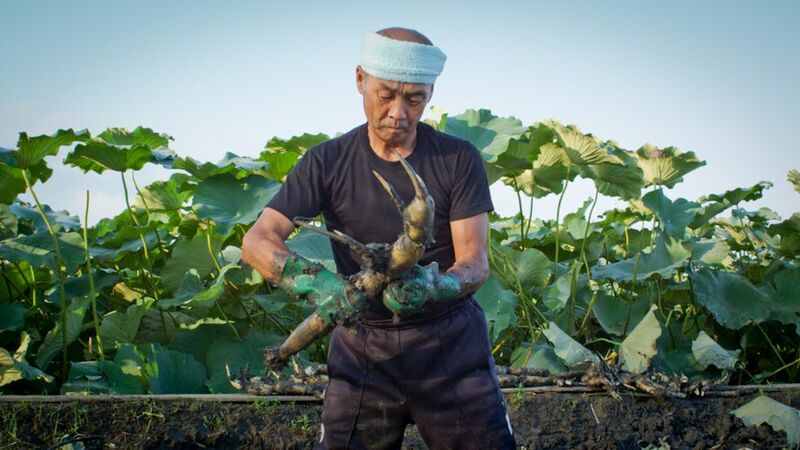 Both booklet and DVD feature Kanazawa’s local vegetable cultivation, where fifteen traditional vegetables — such as utsugi pumpkin, hyacinth beans, and violet-stem eggplant — have been designated as “Kaga” vegetables by Kanazawa city. Kaga vegetables feature highly in local food stores, and their strong reputation makes them popular further afield. The designation of traditional varieties as “Kaga vegetables” reflects both local cultural values (and the role of local produce in community identity) and more recent global discussions on the need to safeguard traditional varieties (that are increasingly threatened by widespread introduction of modern breeds). The cultivation of Kaga vegetables has been shaped by farmer’s seed choices, while adapting to specific environments over generations. Not only are these vegetables embedded in local cuisine, customs and social relations, but they also contribute to nutritious diets, income generation and agro-biodiversity conservation. The messages in the booklet and documentary are, however, transferable beyond Kanazawa. Both offer accessible learning tools that can be incorporated into training programmes and educational activities elsewhere in Japan and further abroad. By drawing on systematic research, the project proposes a common conceptual lens, through which cities everywhere can view their relationship with nature. “The work connects rich, detailed information on local nature-culture networks while it offers a perspective on how the issue of cities and biodiversity can be conceptualized in more general terms, so every city can express their findings, even if different, with a shared language,” Moreno-Peñaranda explains. The pure, cold running water of the late autumn and winter months was essential to traditional Japanese paper manufacturers. Today, hand-made paper produced from natural fibers in Kanazawa continues to delight with its versatility, depth of texture, colours and the way it is folded when wrapping gifts. Photo: Ryo Murakami. Listening to local voices on biodiversity was essential to encapsulating the intricate relationship Kanazawa city dwellers have with their natural surroundings. However, as Brand reflects, the question of how to represent and convey these voices was also “one of the biggest challenges”. 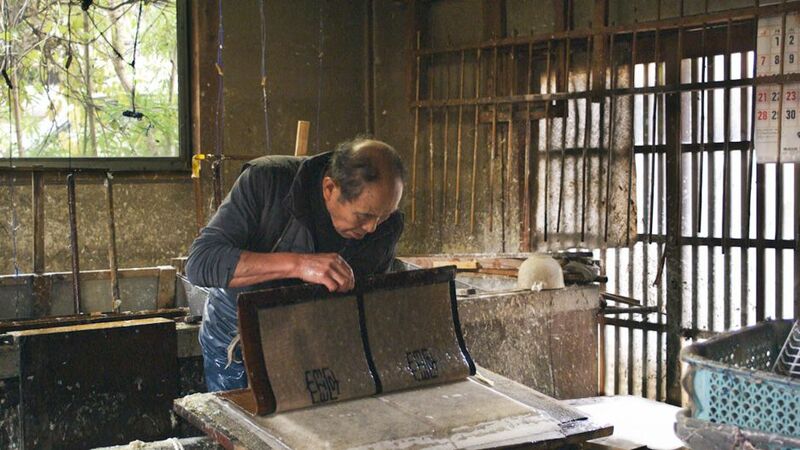 These local stories, like that of Hiroshi Matsuda, one of the last surviving Kanazawa artisans who still hand-makes traditional paper umbrellas, are interwoven into the booklet and DVD. Matsuda explains that a century ago, over one hundred stores were dedicated to producing traditional paper umbrellas, which relied on local natural materials. He explains how the umbrellas, through both their artistry and functionality, revealed an example of how climate and nature influence material culture and lifestyle. 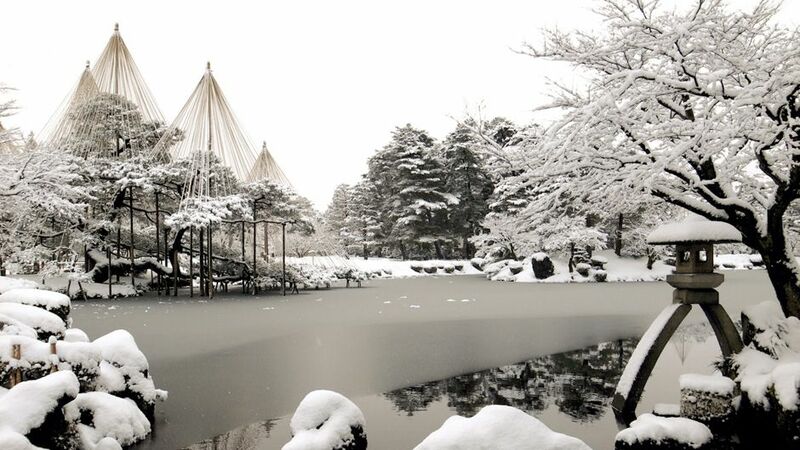 Each year before winter, trees in the city’s main park, Kenrokuen, are shrouded in rice-straw ropes suspended from poles erected amongst the branches. These protect the trees from the winter snow. Many features of Kanazawa’s cityscape have developed in response to the winter climate, from traditional houses with low eaves that protect against wind and snow, to streets equipped with canals, and various ingenious methods to make ornamental gardens withstand the weight of accumulated snow. Photo: Yoshiaki Adachi. The Book of Seasons documentary and Biodiversity in Kanazawa booklet highlight that the richness of any local culture is a direct reflection of the appreciation and depth of interaction that people have with local biodiversity, even in urban environments. They show that understanding the unique culture of a city is fundamental to making a city more “biodiversity-friendly”. “The UN decade on Biodiversity is about to start, and in a world becoming rapidly urban, cities will necessarily have to be heard. If Kanazawa’s case can somehow be part of these efforts and send out the message that culture and biodiversity are deeply linked, the booklet and DVD will accomplish much,” Moreno-Peñaranda says. In Kanazawa, there are signs that this is already underway, as the growing awareness amongst residents about changes in their natural surroundings is leading to new policies and practice. The local government has introduced a number of initiatives to curb biodiversity loss, such as the promotion of organic farming, protection of local seeds, and restoration of degraded forests. These efforts are being developed together with local stakeholders and institutions, making Kanazawa an attractive case of how to combine biodiversity and urban policy objectives. 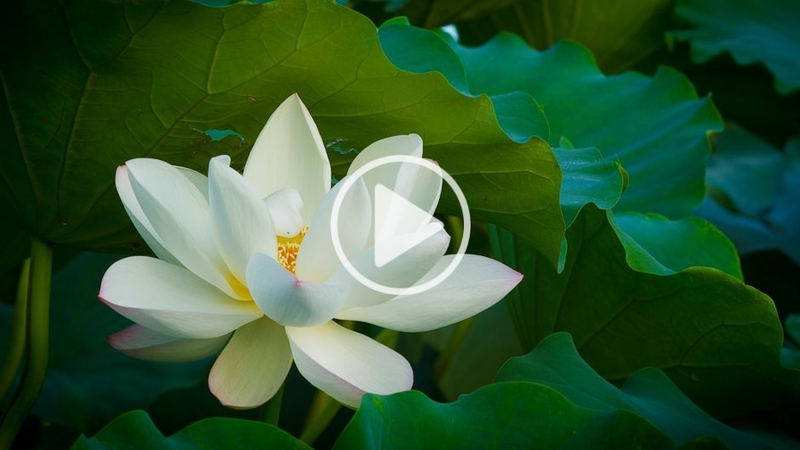 Brand hopes that the Kanazawa community’s love of nature captured in the documentary can continue to “remind people living in the other parts of the world to remember their affection for the land and nature”. “The main lesson to be extracted from Kanazawa is that culture matters. We cannot — and should not — think about cities and biodiversity without understanding local values, customs, traditions, and ways of life,” Moreno-Peñaranda says. McDonald was also keen to point out that we have to give the people of “Kanazawa a lot of credit for their constant spirit to try and preserve the traditional crafts that are made using natural materials from the surrounding environment”. Next week, as the new season arrives, we will feature winter from the Biodiversity in Kanazawa booklet and the corresponding chapter of the full documentary. Anne McDonald became the director of the UNU Institute for Advanced Studies Operating Unit Ishikawa/Kanazawa in April 2008. She has extensive experience in field research of rural and fishing communities in Japan and her interests include Japanese Studies, Environmental Studies and Environmental History with a focus on agricultural and fishing societies. She has received numerous awards for her work, including the 2004 Canadian Prime Minister’s Publishing Awards. She is an active member of committees such as in the Ministry of Agriculture, Forestry and Fisheries, the Global Environmental Forum and several others. Dr. Raquel Moreno-Peñaranda is a Research Fellow at UNU-IAS OUIK. Her work focuses on sustainable natural resource management, looking at the linkages between nature and society. One of her core projects studies the role of urban ecosystems in sustainability and local wellbeing, paying special attention to local culture and values for enhancing local ecosystem services and biodiversity, and thus contributing to improve quality of life in cities and reducing urban ecological footprints. She is also involved in coastal/marine sustainability research, exploring Satoumi as an integrative framework for conservation and sustainable use of biodiversity and effective environmental governance in Japan and beyond. In addition, she is working on dynamic conservation strategies for agricultural biodiversity hotspots in Japan and other Asian countries. Alongside her three core projects, she is also engaged in research looking at the socio-ecological sustainability of oil palm in Indonesia, environmental assessment of coastal areas in Okinawa (Japan) and the potential of urban ecosystems for carbon mitigation, biodiversity protection and local wellbeing in the city of Sao Paulo, Brazil. Moreno-Peñaranda has carried out extensive consultancy, advisory, and research coordination for several local and sub-national governments, international environmental NGOs, civil society organizations, and multilateral development institutions, including the Global Environmental Facility in Washington D.C.
Kaori Brand is documentary filmmaker with extensive experience in the United States and Japan. Currently based in Tokyo, she directs and produces broad-ranging, diverse documentaries for the UNU Media Centre that explore the relationship between humans and nature and sustainable development.Brand is also one of the main producers of Our World 2.0, the award-winning UNU bilingual webzine that highlights solutions to global challenges such as climate change, food security, biodiversity loss and peak oil. She was a director and producer on the UNU documentary “The Wisdom Years”, which explores aging in Japan and its effects on society, and also worked as an assistant producer on the English-language version of “Pokémon”, the popular anime series. Her current projects include working on a documentary on “satoumi,” which looks at traditional systems of land and coastal management in Japan. Lessons from the seasons: Biodiversity in Kanazawa by Heather Chai is licensed under a Creative Commons Attribution-NoDerivs 3.0 Unported License. Heather Chai is a former writer and editor for the United Nations University website editorial team. She is a diplomat in Australian Government. Heather holds a Masters of Arts in International Studies from the University of Technology Sydney and a Graduate Certificate in International Development from Deakin University Australia.